After three straight travel days of getting up at 5am, it was nice to sleep in today. Our travel partners the next several days are old friends of my parents, Mike & Billie, and they were set to arrive late morning. Mike was the best man at my parent’s wedding so I am bound to hear some good stories this week. Prior to our departure last week, the weather was forecasted to be beautiful all week in Philadelphia. But today we woke up to low 60s and rain, and it rained all day long. Oh well, better to keep the fair-weather tourists away. Mike and Billie drove over from their home in Delaware. 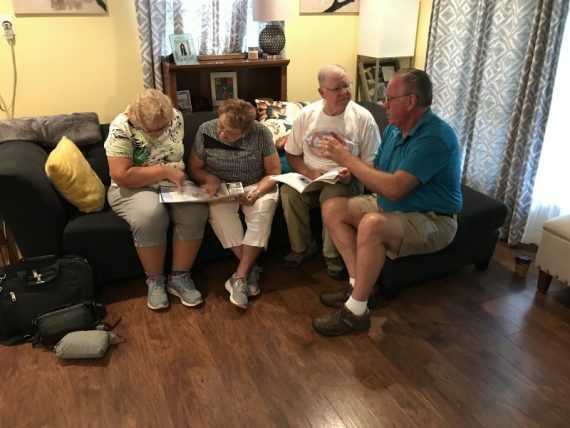 My folks have not seen them in about four years, so everyone is looking forward to catching up. Upon their arrival, we worked to figure out the plan for today. 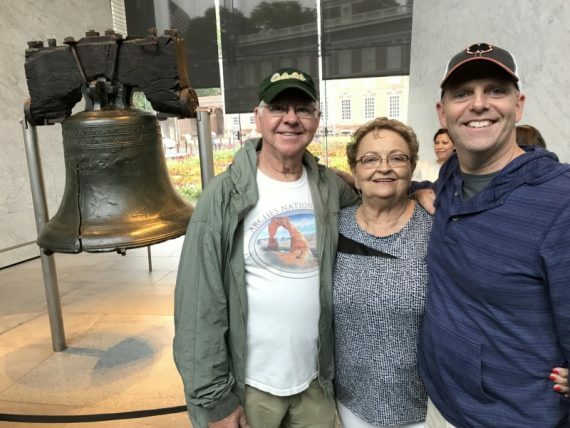 The easy answer is – let’s see the Liberty Bell and Independence Hall. With that worked out, we caravanned downtown to the Doubletree where Mike and Billie are staying this week. We parked in their parking garage and used that as our hub for the day. 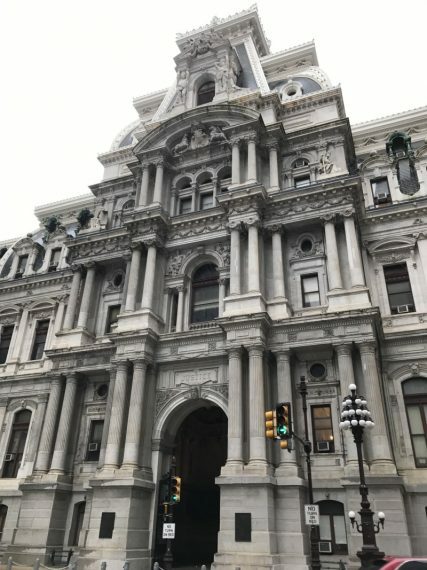 We set out on foot to catch the Philly Phlash, a tourist bus that can take you around to the various spots around town. Mike is quite the tour guide and pointed out a lot of Philadelphia history to us during this walk, and throughout the day. Close-up of City Hall. This building is imposing. After a lengthy wait at the Philly Phlash bus stop, we hopped on the first one we saw and rode it to the Liberty Bell area. There was a very short line for the metal detector, and we were inside the Liberty Bell Center. The Liberty Bell Center opened in 2003, and was my first time seeing it. 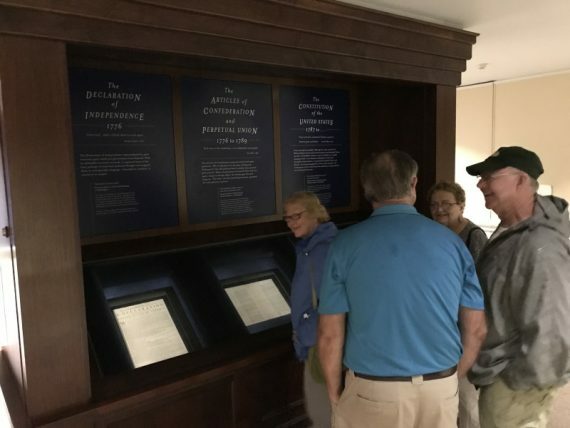 It was an attractive facility and the displays focused on how different subsets of Americans have been striving for liberty over the years. While waiting in the crowd, waiting for our chance to take a picture with the bell, Billie and I remarked on how much history we had learned from the movie National Treasure. 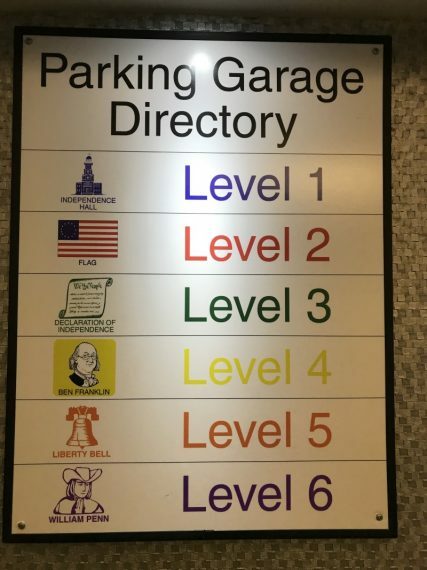 When you exit from the Liberty Bell Center, you are across the street from the front of Independence Hall. It turns out you need free tickets to get into the tours, so Mike hustled over to the visitors center to get us some. On the “back side” of the building is Independence Square. The Declaration of Independence was first read to the public at this spot on July 8, 1776. 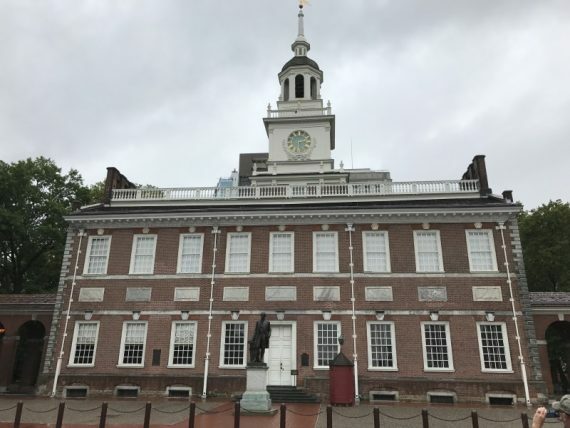 We had a pretty good tour of the two main rooms in Independence Hall. The Park Ranger spoke about how the rebels got the word out about their plans to declare independence, and (hopefully) gain allies. He contrasted it to using social media today, but back then conversations were had in taverns, specifically those found near ports. Ports have sailors and those tavern conversations would get carried from port to port and to other countries. Following our tour, we went next door to the Great Essentials exhibit. 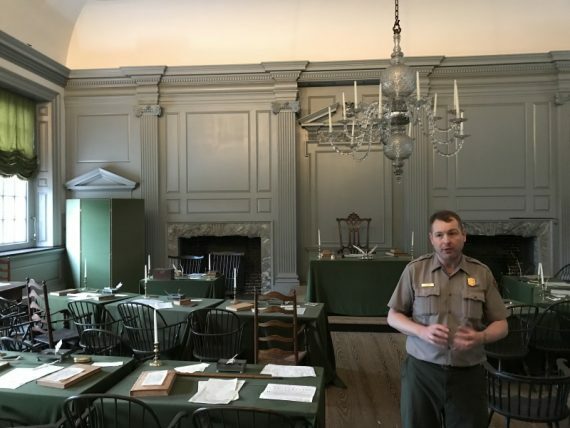 This room contains original copies of the Declaration of Independence, Articles of Confederation, and the Constitution. 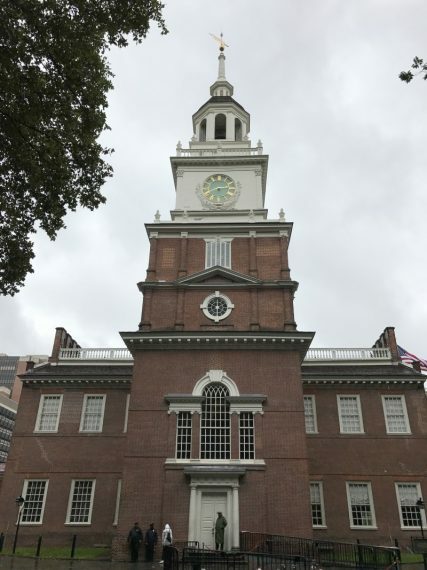 The next step was an ice cream break at Dairy Queen just steps from Independence Hall. During this rest stop, I got to hear a few stories from Mike and KK’s youth where it became clear that they were glad social media did not exist back then. We wrapped up our sightseeing with a trip to the Independence Visitor Center. It was here we got to hit up our very first gift shoppe of our vacation. We also fit in a short movie and a walk-through exhibit. Something I found interesting was how architecture and American’s attitudes reflected off each other over time. Originally, there was the Georgian style, reflecting loyal British colonists; then the Federal style, representing a strong central government; and finally the Greek Revival style, which identified with the democratic ideals of that ancient society. 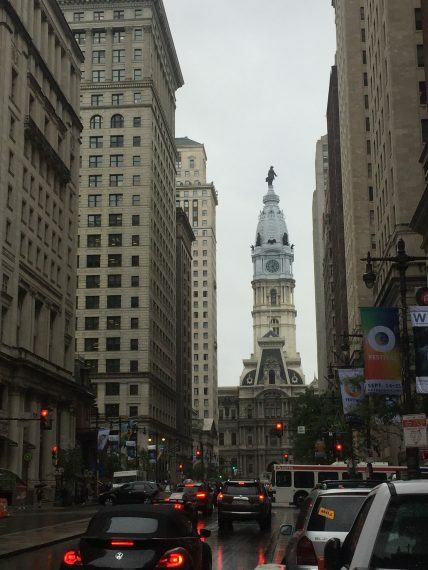 There were predictions that Philadelphia would become the Athens of the western world. 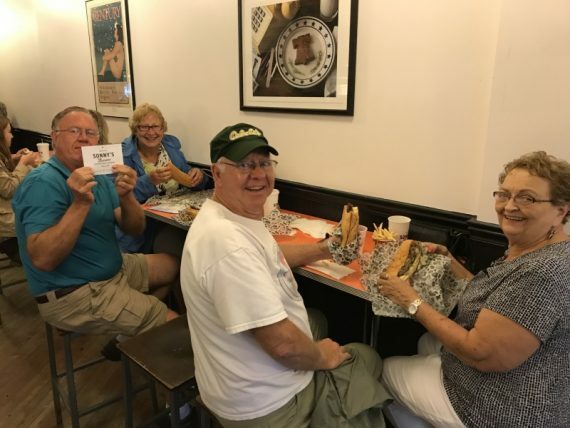 After hours of soaking up the history of the Liberty Bell, Independence Hall, and Philadelphia in general, it was time for something even more important – having a Philly cheesesteak sandwich. 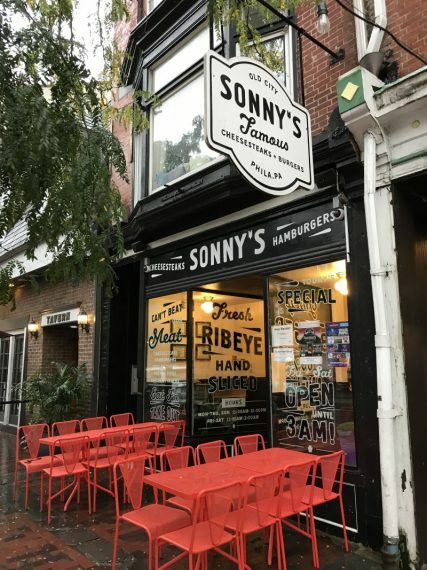 Mike got a recommendation of a good local place for cheesesteaks, and we walked a few rainy blocks to Sonny’s on Market Street. The seating area is not large, but holds more than you think at first glance. Sonny’s provides instructions for how to order the sandwich right there on the menu, and the staff was very friendly and helpful. Most of us got The Classic, which was the beef cheesesteak with onions and cheese whiz. Who would have thought I would ever order anything with cheese whiz on it in my life? The sandwiches were fantastic and messy and filling. 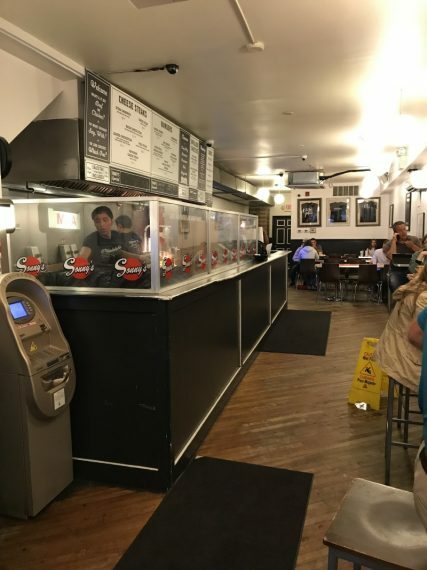 It was a great experience, and maybe if I am lucky, I will get to have another cheesesteak before we leave town. The Philly Phlash only runs until 5:30 or so, and our dinner ran longer than that, so we had to take a city bus as far as we could, and then take the rest of the way on foot. Once back at the Doubletree, we said our goodbyes and agreed to meet at 10am tomorrow at our next museum. Everybody gets some well-earned rest and we are back at it again tomorrow. Looks amazing. Now you will have to be the tour guide for the rest of your family when we go!